Sarosh Olpadwala, Director of Real Estate, DMPED (standing at left). Hill East Task Force chair Dan Ridge, (far right) – and to his right, Commissioner Denise Krepp. 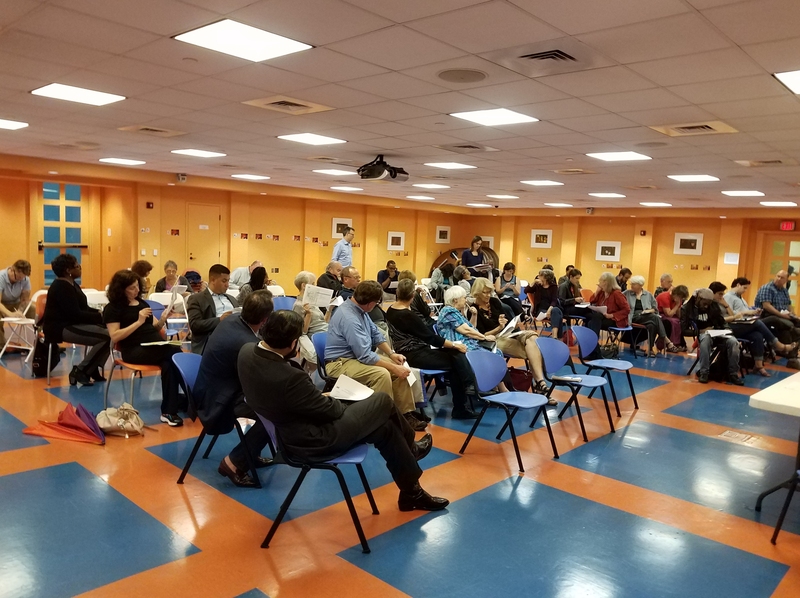 Some 40 Hill Easters attended last night’s ANC6B Hill East Task Force meeting. 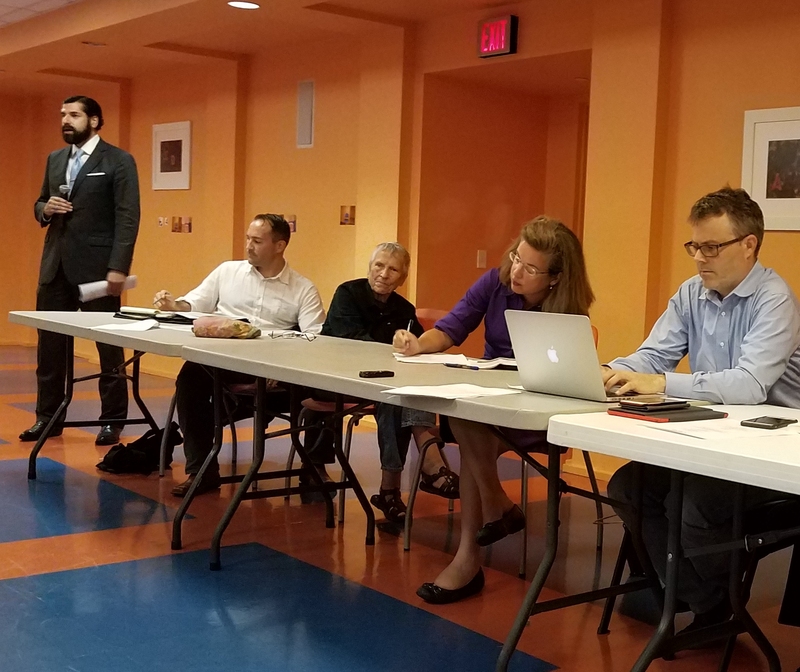 The announcement came at a meeting of the ANC 6B Hill East Task Force, chaired by Commissioner Dan Ridge. The meeting was held in response to a request from Commissioner Denise Krepp, who has been prodding the city to commit to breaking ground before a year-end deadline. Krepp said during opening remarks, “We’re going to walk out of here tonight with the knowledge of when the dirt goes”. In September of 2013, DMPED awarded the proposal to develop two city-owned Reservation 13 parcels to the Donatelli-Blue Sky Construction team. The proposal is for a mixed use project, built as a matter of right (no Public Unit Development (PUD) process required), and envisions 353 residential rental units, 30% of which will be affordable, and 20,000 plus square feet of retail. The latter would allow for up to ten ground level retail spaces in two buildings, with the possibility of expansion into some 8,000 square feet below grade for a retailer with additional space needs. The rental units – both market and affordable – will range from studio to three bedroom units. The deadline for the city’s commitment to the project, having been extended once, expires at the end of 2017 without another extension. Ridge offered a resolution seeking to clarify what the prerequisites for going to closing are, and urging the full ANC to send letters to DMPED, DDOT, and DCRA urging them to complete the permitting process with all due speed. The motion passed 5 – 0, and the full ANC6B will consider it at their November meeting. The jail needs to be closed and moved somewhere else – wasn’t there a proposal to move it to Blue Plains?